Tracks 1, 4, 7, 8, 10, 12, 14, 15 composed by YASUNORI MITSUDA. Tracks 2, 3, 5, 6, 9, 11, 13 composed by HITOSHI SAKIMOTO. Tracks 1, 4, 5, 13, 12, 13 arrangements by KIMIHIRO ABE. Tracks 2, 3, 6, 7, 8, 9, and 11 arrangements by NORIYUKI KAMIKURA. Track 15 arrangement by HIROAKI YURA, MINAH CHOE & ZANE BANKS. Tracks 10 and 14 are in original form. 'Destiny' was an internationally acclaimed concert tour by an elite piano quintet from the Eminence Symphony Orchestra, debuting in Yokohama, Japan on the 16th of July, 2007. The tour took the group to three different continents, including the countries Japan, Australia, and the United States of America. 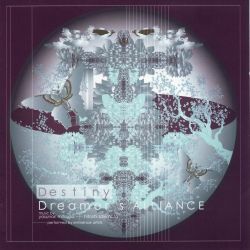 Featuring video game music from recently released and classic video game titles in brand-new exclusive arrangements, the 'Destiny: Dreamer's Alliance' album is endorsed and supported by famed composers, Hitoshi Sakimoto and Yasunori Mitsuda. It features official arranged versions of selected pieces from Gonzo's recent hit anime series 'Romeo x Juliet', with music by Sakimoto.